Sarah enlisted the help of youth from the Association to Benefit Children (ABC) and the Pelham Fritz Recreation Center, along with 2006 Create Change artist, Rudy Shepherd to develop an object for their Harlem neighborhood. Sarah asked her young neighbors’ to record their visions for Harlem and/or themselves 30 years from now. They did just that via drawings and declarations like “In 10 years this city is going to belong to me!” written on plain ceramic tiles. Transforming these tiles, along with glass, mirrors, and other found objects, into a mosaic-pattern on a set of benches Rudy constructed of reclaimed wood, Sarah began this labor intensive process with the same group of children who helped to shape the benches’ content. The completion of the benches, however, took place in front of two public spaces: The Laundry Room on 116th Street; and Pelham Fritz Recreation Center in Marcus Garvey Park. Sarah Kolker, a graduate of Sarah Lawrence College, was born and raised in Philadelphia and has studied health and wellness practices in Philadelphia, Jamaica, SF Bay Area and New York City. Sarah is an Artist, Arts Administrator, Chef and Certified Yoga Instructor. As an Artist she has worked with well-known mosaic tile artist Isaiah Zagar, the Philadelphia Mural Arts program, Groundswell Community Mural Project, DOPE SWAN, and has completed a Create Change Residency with The Laundromat Project. As a Chef, Sarah started at A Full Plate Cafe, worked at Integral Yoga Foods, and was honored as Chef of the Month at Cafe Gratitude in Berkeley CA (read more about it here). Sarah recently consulted for Pure Sweets in Philadelphia. Sarah’s specialty is gluten free and vegan and sometimes raw “baked” goods and salads. 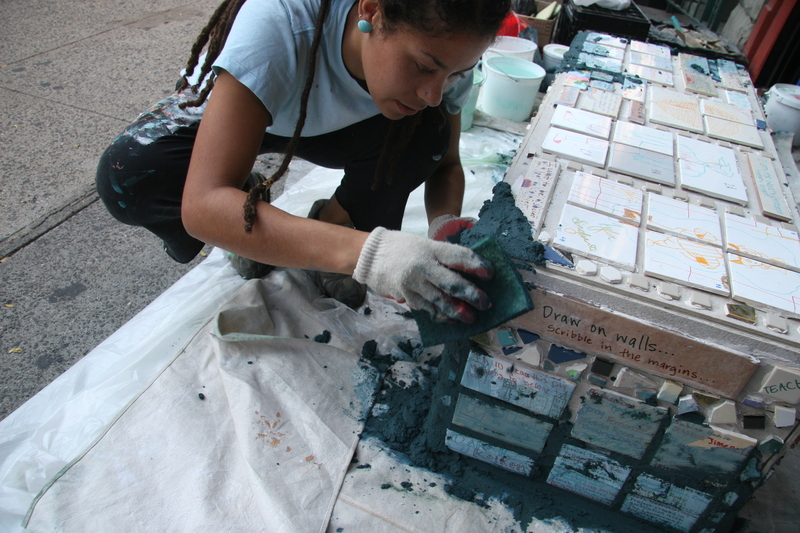 Sarah organized “How to Build a Community,” an Earth day event in Queens New York, and 2008’s Art Fence for New England’s Culture Fest. Her work has been displayed at The Protest Space in New York’s Chelsea art district, Yippee Museum for Af3irm’s Annual Transnational Woman’s Art Show, New York University, at the Barbara Walter’s Gallery, at 10th Street Laundromat, Dirty Girl Brigade Boutique, Rock Star Crystal Gallery and at the Infusion Gallery in Philadelphia, and Guerilla Cafe in Berkeley, CA. Sarah was trained in Raja Yoga at Niroga Institute in Berkeley Ca. She holds a certificate in Adult Yoga and Youth Yoga and has taken workshops at Omega Institute on teaching Mindfulness to youth. Sarah has offered Mindfulness Trainings to teachers and students alike, and has consulted in Mindfulness for ArtWell Collaborative.